We usually design our gardens to look their best during the daytime. We sow and plant vivid daytime-blooming plants and carefully consider sun exposure to serve both plants and ourselves. Gardening popularity. In the case you’ve missed it, gardening is back in style, which means people often spend time and organize events in their gardens. 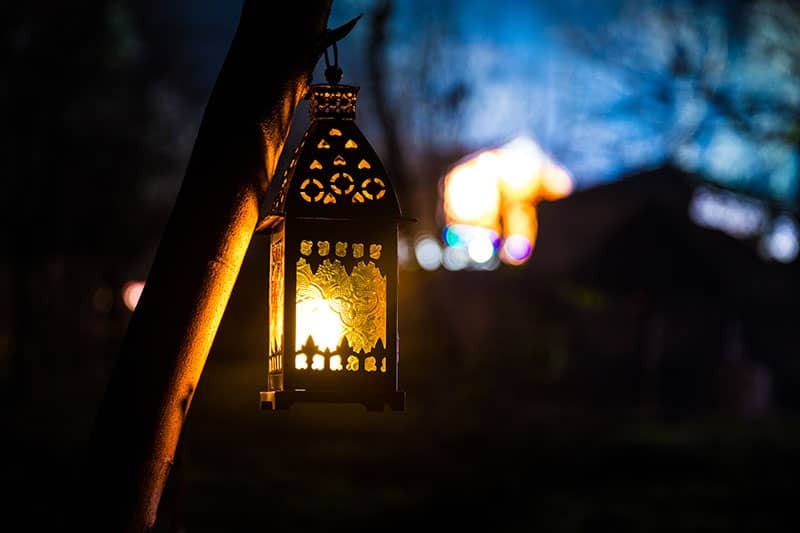 Since many events and celebrations take place after sunset, it is obvious you will need proper lighting if you want your guests to feel cozy in your garden. Work. People around the globe work a lot - over time, several jobs, with long hours stuck in traffic. That means that many simply do not have the luxury to enjoy their gardens during the daytime. Climate change - Rising temperatures and heatwaves are making it harder to enjoy our gardens during daytime in late spring and summer. Spending an evening in your garden is a perfect way to cool yourself down after a hot day, both physically and mentally. That means that you should consider not only how your garden will look during the day, but also at the time when the sun goes down. 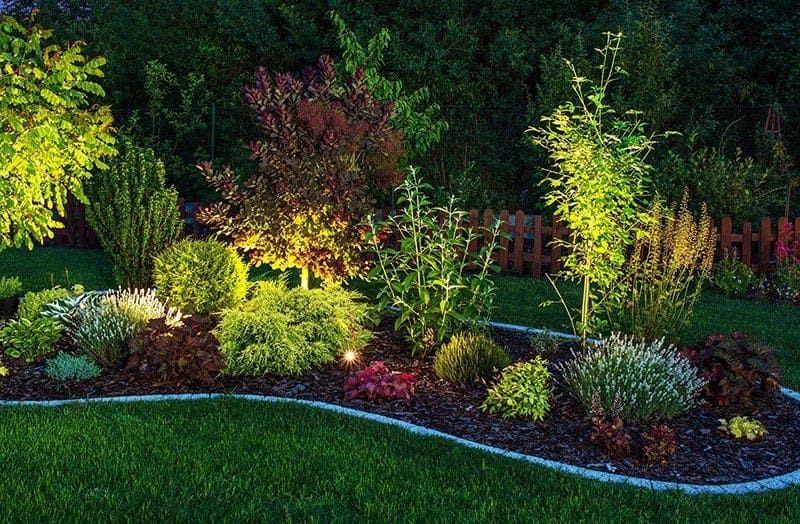 Perhaps the most essential ingredient for a good-looking night garden is lighting. Fortunately, there are many garden lamps to choose from. While some are pretty clean and straightforward, other setups will let you get playful. With a little bit of imagination, you can turn an evening in your garden into a spectacle! Let’s explore the options - from the classic choices to the more eccentric setups. 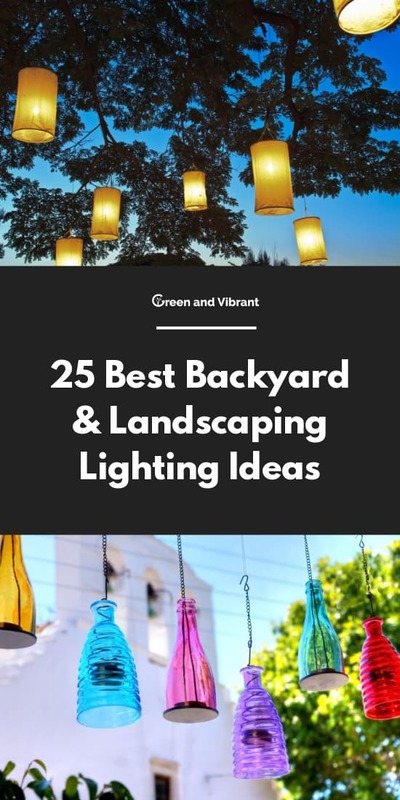 Here are 25 awesome ideas for lighting your garden. For easier navigation, I’ve divided them into three categories: Classic, Stylish and Artistic. Classic lamps are the ones most commonly found in gardens all over the world. They are usually affordable, easy to get and are a good, stable light source. Although there are still electric and battery-powered models, the solar-powered lamps seem to be taking over the market - good news for the planet and your electric bill. Cheap and abundantly available, spotlights used to be a standard for lighting gardens. They provide a stable, reliable and intense light source. They are practical for lighting garden walls, trees, and other tall and massive garden structure. However, keep in mind that they are not suitable for lighting smaller areas, your favorite resting place or any other spot where you will be direclty exposed to the light - it is simply too strong. Illuminating the garden walkway with a row of small solar lamps is becoming a new classic. The installation is simple - you simply dig in or stick in the soil next to the walkway. From then on, the lamps will pretty much take care of themselves - the battery charges itself with solar power and the lights will turn on and off by themselves when the outdoor light changes and/or when someone comes near the lamp, depending on the type of the sensor it is equipped with. Bollard lights are taller and usually more powerful than the low-laying spike lights. That makes them suitable for larger, open gardens, lawns and driveways Bollard lights are available in different shapes and light regimens. If they are not solar-powered, they operate on electric power, like miniature street lights. This 360-degree design with the light directed slightly downwards is a classic bollard light model. Ground lights are becoming increasingly popular. The simple round shape and underground setup make the entire lighting installation minimal - the light truly seems to be coming out of the ground. The only issue with this type of lamps is they emit light from below towards the sky - which can get tiresome, blinding, and makes for the worst portrait light source in the case you wish to take photos with ambient light. You can overcome the issue by carefully blending the lamps with the vegetation so the plants can diffuse the light a bit. While this is mostly a matter of taste - I would always opt for warmer floor lights, as in this picture. Lights in the cooler part of the spectrum can be hard on the eyes. These wall lamps are designed to fit staircases. With their simple, sleek design, they will fit into pretty much any garden space and emit their light beams exactly where they are needed. If you have a staircase on your property, it will not only look better - it will also become a lot safer with these lights. This neat little spike lamp is designed with reducing light pollution in mind - its small top cover prevents the light from spreading upwards. Therefore, it won’t be blinding your view and won’t reduce the visibility of the night sky. Because of these features, it can easily become a hidden lamp that will illuminate your precious plants without attracting too much attention to itself. The advantage of “hiding” a lamp in the grass turf or a bush is that the bush will look illuminated. If the plant is big enough, the lamp practically won’t be visible from a distance. Instead of lighting your garden from the sides or above, with excess light blinding your view, snuggling the lamps in among the plants can protect your eyes, plus give a striking visual effect. The previous example already shows how “snuggling” the lamp right next to a plant looks at a close range. Here’s how it looks like from the distance when applied to the entire flower bed. The small LED lights are carefully placed so plants in front rows block the light from shining directly forward but emit light to illuminate the plants. This type of lighting will put your plants as the main display. Stylish lamps are a category for people who want more than just illumination - it is for those who prefer the lamp to be a decorative object itself and are willing to pay a higher price for it. String lights of different sizes are a hot trend. In this case, the symmetry and smoothness of the classic string lights contrast the rugged wooden fence, creating a playful twist. I have to admit that I am a big fan of these modern-meets-rustic crossovers. The only trouble is that bare, transparent tungsten lightbulbs can be a bit blinding when they are in line with your eye level. If you have sensitive eyes, milky white bulbs could be a better solution. One of the interesting ideas for garden and public space decoration is the utilization of small string lights - those that would usually be considered Christmas lights - as an all-season illumination, which looks especially attractive o bigger trees. I call it the “firefly effects” - rows of small white lights are wrapped around trunks and canopies create a magical fireflies-and-fairies feel in the garden. Paper lanterns give a special warm feel to a garden space. They make us reminiscent of summer days and joyful celebrations. Cylindrical paper lanterns are slightly less attractive than the classic round ones, but this can be an advantage - it makes them easier to fit into different garden arrangements and styles. Be aware that paper lanterns are not a permanent lighting solution. However, they can be a perfect one for parties or other joyful events in your garden. Of course, considering the material, the weather without rain is a must. Bamboo torches are a unique and relatively cheap way to provide your garden with some primal, tropical lighting effects. 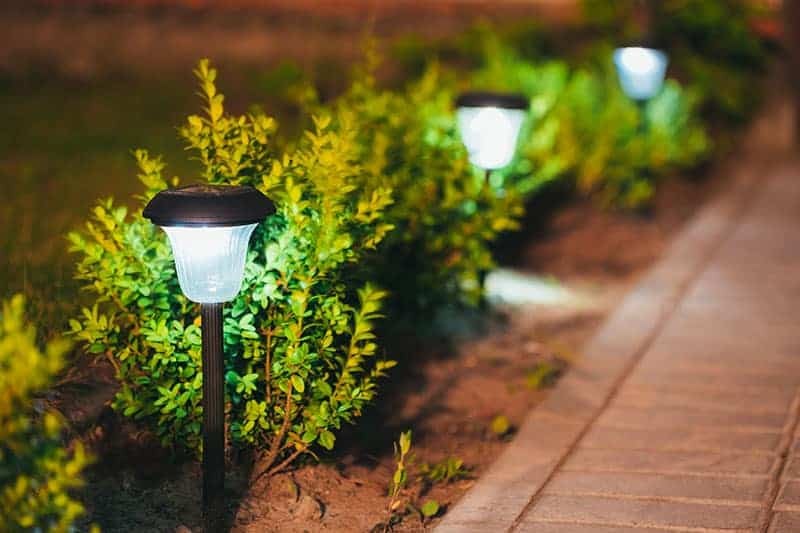 They are readily available at garden centers and are a common choice for special events or other cases you need to light the otherwise-unlit parts of your yard since they are not practical for nightly (all-night) use. Since they feature an open flame, be careful when using torches - especially if you have little children or pets running around. Safety should always come first. Also, the burning oil in the black canister emits an odor which might bother sensitive people. Bamboo torches look best in oriental or tropical-style gardens. If you like torches, but don’t like the bamboo texture or you find it unfitting for your garden, there are other options. Although bamboo torches are the most famous and abundant, there are metal garden torches available as well. Their design can vary, but all will most likely be more durable than the bamboo ones. Besides providing the light, garden lamps can be a stand-alone decoration. These two beautiful ball-shaped ground lamps are a perfect illustration of that. Not only that they are pretty objects themselves, but they cast a beautiful light as well. Contrasting ground installations with tall vegetation such as trees can create a good visual balance. As you can suppose, you can expect to set aside a bit more money if you crave lamps like these in your yard. Old-type lanterns were a must on porches before electric lights became dominant. Their simple, classic design was actually multi-functional - you could hang one as ambient light, but also take it in your hand and use it as a torch lamp. Old vintage lanterns are oil-based, which is something you should have in mind if you intend to use them. If you can’t find a true antique lantern, there are many new vintage-inspired models available. Vintage and antique lanterns are a stand-alone decoration. Besides the classic lantern, they are often inspired by old European street lamps. You can hang them on your porch, walls, trees or specially designated strings. Although you can find vintage-style lanterns relatively cheap, these are usually light and roughly made. The finer the lantern, the more expensive it will be. This square art deco lantern is not just about the looks; it’s second main feature is the way it casts its light. That is why it is worth putting it on a designated higher spot in your garden. Besides being a decoration itself, at night it will create interesting shadow play in a radius of a couple of meters around it. This rustic romantic setup prepared for a wedding will give a special warm feel to your event. The combination of antique-looking candle lanterns and simple round string lamps combines rustic chic with modern style, creating an original and a striking effect. The lanterns will look attractive enough during the day, or when just illuminated by the lamps, so you can keep it even when you don’t need or can’t have the real candles lit. Depending on the type, you may be able to repurpose some of them as ad-hoc bird feeders! Lamps in this category vary in their design but have one thing in common - they are different. Whether they are DIY or commercially-made, they are sure to bring a sense of originality and free spirit into your garden. Colored glass bottles - most common in brown and green, but also obtainable in other, more vivid hues - can be repurposed to become your garden lights, giving your backyard space a special charm. The bottles can become simple hanging candle holders, or you can equip them with electric bulbs. Here is a simple video tutorial on how to make lamps out of wine bottles. If you need a reflector-type lamp, who said they must be square and boring? This stone-shaped casted lamp is made to blend in with the natural surroundings, which is a great option if you have a natural-style garden. It will look like just another rock that, conveniently, provides light at night! If you are going for a hip, modern garden look, this design is worth considering. Lamps in basic colors are hung just in front of the geometric trellises. Geometry and color combined with hanging plants give this setup a warm, urban, alternative look. Did you know that modern garden lights can be so compact that you can fit them into a medium-sized flower pot? This solar crackle-glass LED bulb is snuggled into a green pot containing lush marigolds, practically creating a lamp out of it. Interesting option if you just don’t like to see lamps hanging around during the day. Did you know that beautiful lamps and functional lamps can be made out of clay? Unfortunately, unless you are not practicing pottery, you can hardly make them yourself since it requires special equipment - a pottery wheel and a kiln (a special, heavy type of oven). Since the craft market has grown over the years - especially online - artistic pieces like this one have become a lot more affordable, so they are worth looking for if you are into this kind of aesthetics. With their attractive bulbs, string lamps can be used in various crafty setups. This DIY-style “chandelier” features a square wooden frame, with dry basil hanging between the lightbulbs - which is sure to produce a beautiful fragrance, especially when the light is on. Rustic metal lanterns and lamps do not have to be factory made. You can get an artistic welder to make you one, or buy a pre-made one. This type of lamp has a special charm since it looks a rougher and “craftier” than the factory-made models, adding to a playful, fairytale-like impression of a garden. Every light source you add into your garden - even if it's a tiny one - counts and brings something to the table. This time literally - these little Christmas candle holders can be put on garden tables, staircases, or any other hard surfaces to brighten up your garden nights little by little. Although you obviously can’t use them to light up an entire garden, little candle holders or similar tiny lights can be a captivating addition that will bring joy and relaxation. Garden lights provide that finishing touch that could completely transform your garden. Whether you want the lighting to be one of the main attractions in your garden or just a way to highlight your precious decorative plants, good planning and quality are equally important. Let there be light! I hope you have found out something new and exciting about garden lights through this article. 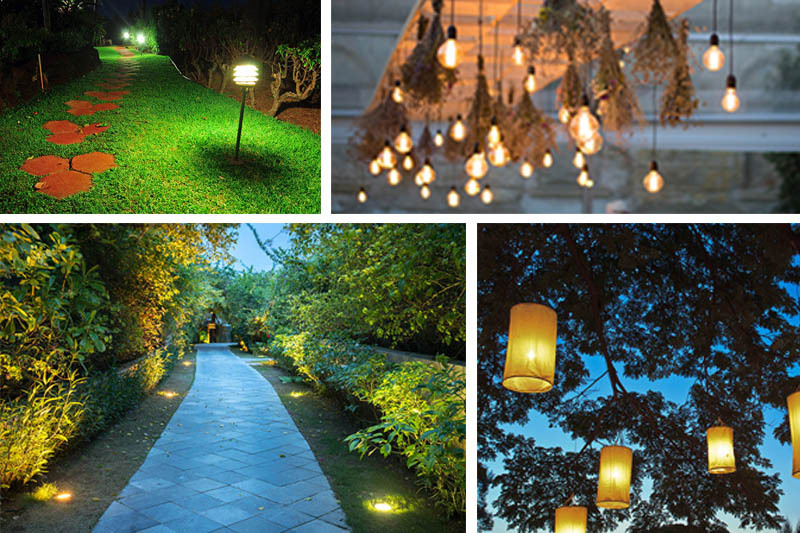 What types of garden lights do you prefer - classic, stylish or artsy? What kind of lighting do you have in your garden? Please feel free to share in the comments!